Despite my crafting deficiencies, I’ve actually been doing quite a bit of it lately. I spiffed up a lamp shade, repainted some mirrors and snazzied up a stool. And now I’ve gone and done it again. See, most of our efforts on the house have been concentrated either on the first floor, since that’s what most people will see, or Isabella’s room. 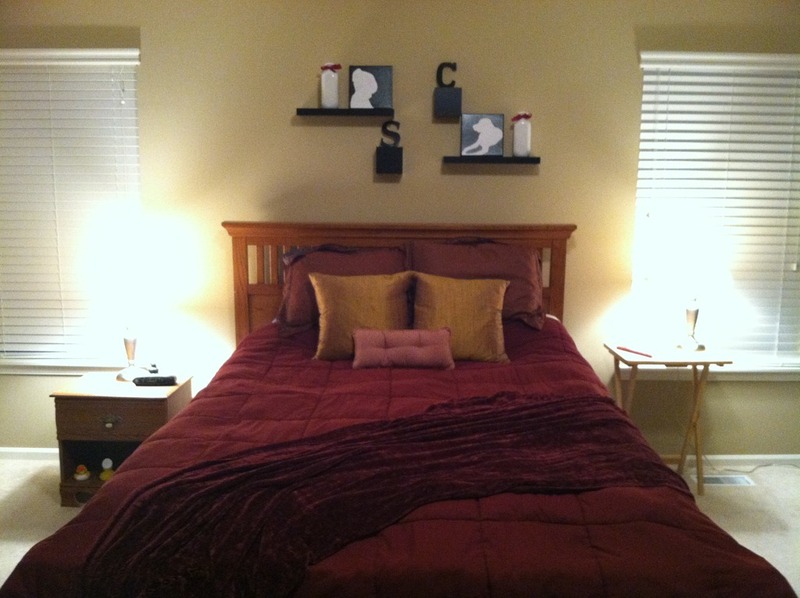 Our bedroom has gone pretty untouched. Then I stumbled across this blog post and was inspired. Aren’t those awesome? We all know how much I love Samson. What better way to honor him than by placing his beautiful silhouette front and center on our wall? That started the wheels turning and before long, I was digging out my trusty can of spray paint again. There are many ways you can do this project. 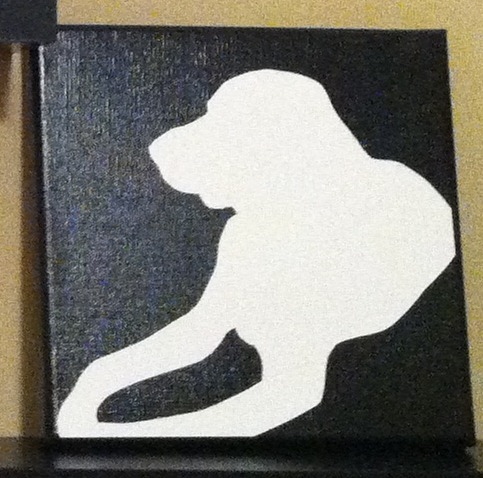 You can trace an outline of your pet on the canvas and then paint around it. You can put a stencil on the canvas and spray paint over it. You can make it all up on the computer, print and frame it. Or you can do what I did, which seemed the easiest: spray paint your canvas whatever color you want. Print out a pic of your pet that measures the right size and then cut it out with an Xacto knife. Cut it out again on white archival paper and then glue it to the canvas with spray adhesive. The whole thing took me about an hour from start to finish (not counting drying time of the paint). I so LOVE how it turned out! But why stop there? 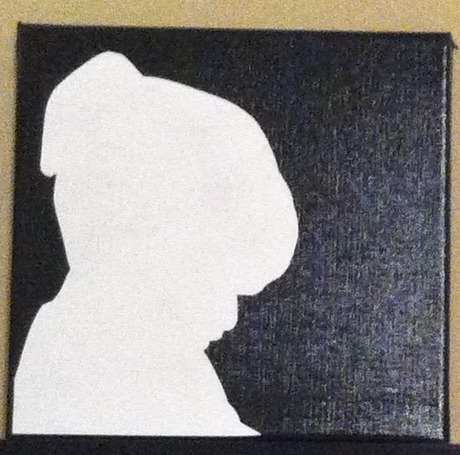 While I was at it, I did a silhouette of Isabella too! Can’t play favorites with your kids you know! LOVE! Love! Love! That pose is very indicative of her personality too. Always heads down figuring stuff out. 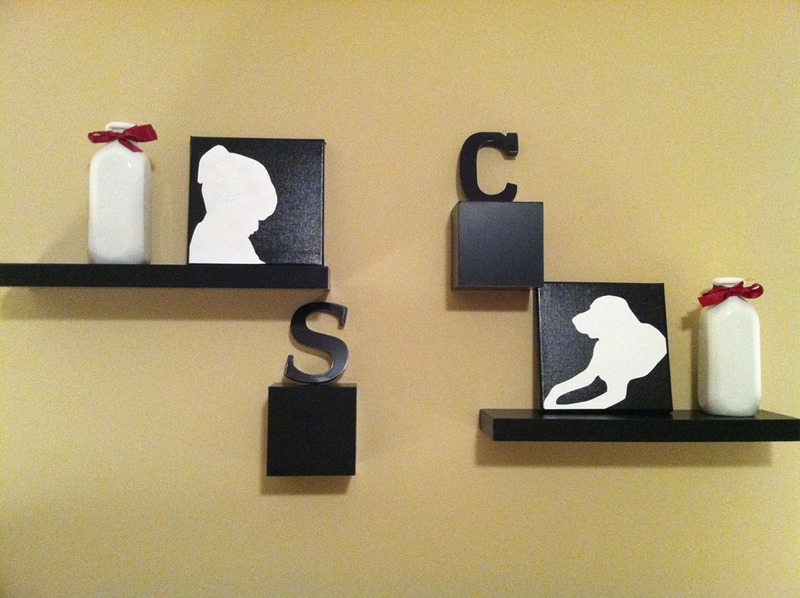 Remember in my post from Sunday how I mentioned spray painting an “S” and a “C”? Well, those went up on the wall with these beauties! Ta da! At first I was worried that it was too much black and white. But now I love the graphic nature of it. High contrast with a hint of color in the red ribbon gives our room a slight edge, so it’s not too “fluffy” (I’m not a very fluffy person). Pretend there are curtains on the windows. This shot would look much better with curtains. I had planned to have some up by now but Target thwarted my plans. It’s a long story. Suffice it to say I bought 2 sets of curtains from there only to have to return all of them for one reason or other. I finally settled on some from JCPenney, which of course were on back order. They should be in our possession some time in May. 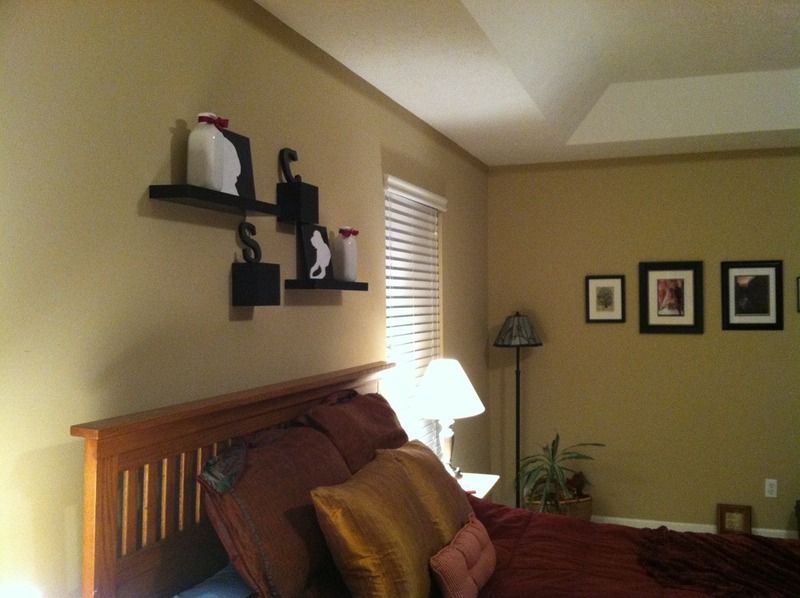 I also like how the black/white above the bed ties in with the black frames on the adjoining wall. I have read over and over that you can unify pictures just by keeping the frames consistent. So the rule in our house is black frame, white matte. Always. I’m super happy with how it turned out. In my head, I had pictured hanging the letters by the red ribbon. But when I went to implement, I didn’t like it. So I went with this instead. MUCH better. I needed some sort of yellow tray to put on the dining room table to bring more of the sunny color into the room. 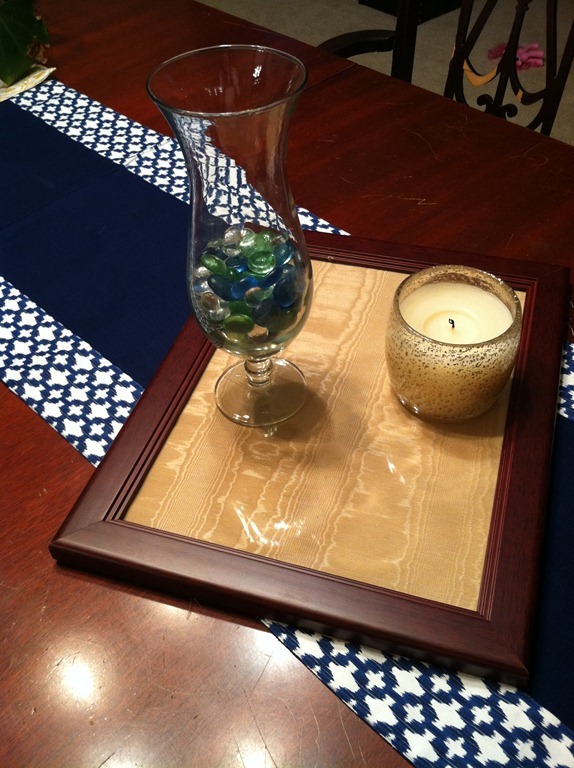 Then I read in a magazine that you could take an empty frame and put fabric in it to make a tray. Voila! 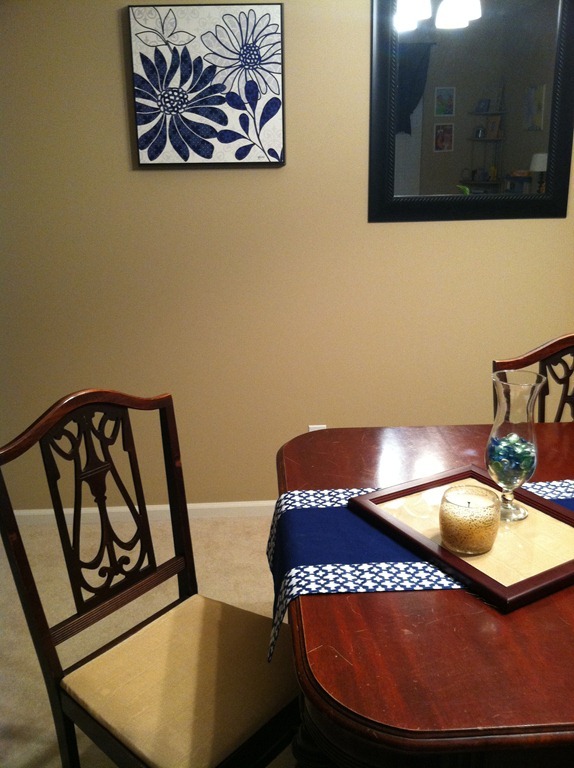 It just so happened that I had some fabric leftover from reupholstering the dining room chairs so I used that! It worked out beautifully! All right, that’s enough “Craft Time with Sarah”. I’m really excited about how all these house projects are turning out and love sharing them with you! I hope it gives someone else inspiration too! 29 Day Organizational Challenge – All done! Thanks!! I appreciate the link!